The Workman® HD series features: a hauling capacity of 3,002 pounds; a 31.5-horsepower, electronic-fuel-injection engine; instant cold-weather starting; smoother throttle response; and onboard diagnostics for quicker troubleshooting. 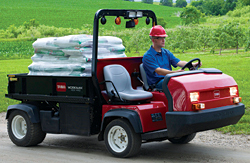 The vehicle is available with an on-demand, four-wheel-drive system that delivers improved traction in forward and reverse without damaging turf. An easier-to-read instrument panel includes fuel and temperature gauges, an hour meter, and warning lights for oil pressure, engine issues, and battery life.